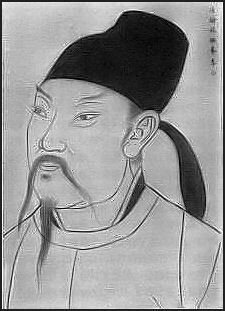 The famous Tang dynasty poet Li Po (Li Bai, Li Po, A.D. 701-762) is one of the most quoted Chinese poets in China and the West. In China Li is regarded as "the fallen immortal", "the immortal of wine" and the"banished immortal"— “an immortal who misbehaved in heaven and was banished to earth" — and is considered wild, eccentric and possessing special powers. Li Po does not seem to have been very likable as a person. He has been described as "tiresome sort of bohemian, vain and untrustworthy, an irresponsible citizen, a careless friend, an indifferent husband and a terrible drunk." Other than a short stint "polishing" Imperial documents, Li never had a job and didn't seem to make much money from his poetry. He appeared to have survived by sponging off relatives. Li once referred to himself as the “god of imbibing." It was said he was capable of “producing 100 poems after drinking a whole dou of wine." A dour is equal to about 10 liters..
Lower it, and think of home. Yuan Haiwang, author of “This Is China: The First 5,000 Years,” told the BBC: "The moon in China has a special meaning. And when it's full, that represents the fullness and reunification of the family. So that poem struck the deep core of my heart whenever I miss my family." in misty third-month blossoms goes downstream to Yang-chou. Plucks mulberry leaves by the stream. Red jacket and white sungleam. Please don’t prance your five steeds by again! Life's joy an instant springlike blooms. I dance. Shadow reels and rolls. Drunk, we scatter on our ways. And pledge to meet beyond the Milky Way. In his later years, Du Fu was so poor that one of his children died of starvation. He wrote a famous poem about a gale that blew the thatched roof off his cottage, over the river and into the tree-tops, allowing rain to fall on his children in their beds. Du Fu writes that he could not sleep, and fell to pondering life's injustices. I saw enough of plotting and intrigue. Has left me hungry at the meat-filled meals. To bring the glow of health back to my face? And lose my way searching the mountain woods. I pray he'll gather up the jadelike herbs. You ask me why I live in the gray hills. I smile but do not answer, for my thoughts are elsewhere. To other climates, to countries other than the world of men. “Frustrating moments aside, the project was a long-in-the-works dream, born of a 2005 Mellon Foundation Distinguished Achievement Award, which gave Owen $1.5 million to fund this and other projects. “The Complete Poetry of Du Fu” will inaugurate the Library of Chinese Humanities, an accessible series of pre-modern Chinese facing-page texts and translations published by De Gruyter. Owen expected the Du Fu translation to take three years, but teaching responsibilities and speaking engagements set him back numerous times. “It owns you. I got teaching relief for a couple of semesters, and I worked on it and I worked on it. It wasn’t that I was lazy,” he said. “You see the territory that has to be done. You have to plow the south 40, and have plowed the south 28, and see what still has to be done.” Owen, who is 69, worked primarily alone, allowing a graduate student to go over the work only after it was complete. “Du Fu’s a great person to translate, but there goes eight years of your life. Finally it’s done,” he said. bleak, bleak, autumn in Ching.ch’u. through the long night I hug my fur robe. leaning alone in an upper room. a pair of white gulls between riverbanks. the pair, at their ease, roaming to and fro. spiders’ filaments still not drawn in. The country is smashed: hills and rivers remain. The city turns to spring: plants and trees grow deep. Resentful of parting, birds startle the heart. Letters from home are worth 10,000 in gold. My daily tasks I don't plan for myself. When I've no clothes I think of southern lands. The hills and streams are fair. Valleys of fine rich fields. By groves of bamboo shoots. Could bring my lifelong wandering to a close. How close I feel the crowd of social cares. Though I roam the hills my heart is never clear. Its meager harvest gleaned from frontier fields. How could it ever comfort an old man? It would be hard to stay adrift here long. Crow cries full above the city wall. Horses watering by the cold pool. Endless and dim the clouds of mist. So vast, all within heaven and earth! My way is long, so long. I'd happily freeze to death in my broken hut!